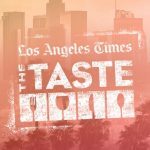 The LA Times Brings Back ‘The Taste’ This Weekend! Taste 2018 Teaser from LA Times Events on Vimeo. Los Angeles Times’ The Taste is an annual food festival celebrating the flavors of the world in Southern California style. 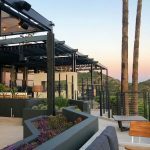 Hosted by The Times’ editorial staff and acclaimed L.A. chefs and bartenders, The Taste will transform Paramount Pictures Studios into the ultimate epicurean pop-up and block party over Labor Day weekend (August 31-September 2). Each ticket grants access to unlimited tastings from the hottest pop-ups, collaborations and pairings from chefs and restaurants around the city. § A special tribute wall in Café L.A. Times. Attendees will be encouraged to share what Jonathan Gold meant to them. § A light installation displaying Jonathan Gold’s 5 rules for dining in L.A.
§ Several restaurants will be serving special dishes inspired by Jonathan Gold, including Faith & Flower, Herringbone, Chiguacle Sabor Ancestral de Mexico and Pacific Dining Car. LA Times’ The Taste has adopted The Collins College of Hospitality Management and L.A. Regional Food Bank as charity beneficiaries for the 2018 event. The Taste is taking steps to reduce the environmental impact of the event with the help of Zero Waste Co., which is providing compost bins throughout the event and inside kitchen tents, and will be taking discarded food, compostable plates, cups, bowls, napkins and paper towels and turning these materials into beneficial soil amendment that helps grow healthy crops that nourish our communities. Samplings from restaurants include: Otium, The Bellwether, Hinoki & the Bird, Pacific Dining Car, Ocean Prime Beverly Hills, FARMHOUSE, Highly Likely Café, Nerano, Michael’s Santa Monica, Poppy & Rose, Paramount Coffee Project, Yarrow, Pearl’s BBQ, Woodley Proper, Bone Kettle, Mainland Poke, Mexicali Taco & Co., Wanderlust Creamery, Umu by Hamasku, Casa Vega, Baltaire, Chao Krung, Puesto, Pop’s Bagels, Amor y Tacos, Bar Garcia, Blue Ribbon Sushi Bar & Grill and more. Samplings from restaurants include: Granville, Coni’Seafood, The Exchange at Freehand LA, Herringbone Santa Monica, Kali Restaurant, Prawn Coastal, Gus’s World-Famous Fried Chicken, Jaffa, Cento Pasta Bar, Winston Pies, Trois Mec, Melody, Tumbi Craft Indian Kitchen, Rappahonnock Oyster Bar, Sichuan Impression, Citizen Beverly Hills, Roe Seafood, Komodo, Maple Block Meat Co., Madre Oaxacan Restaurant and Mezcaleria and more. 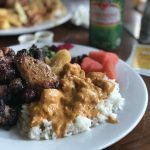 Samplings from restaurants include: Banh Oui, Luv2Eat Thai Bistro, Inko Nito, Hotville Chicken, Jitlada, Wolf, Guisados, Commerson, 71Above, Brack Shop Tavern, Faith & Flower, Bulgarini Gelato, The Arbour, Lao Tao, Manuela, Bourbon Steak, Avec Nous, Momed, The Arbour, WOOD, Lao Tao, Kobee Factory, Yardbird Southern Table & Bar, Meals by Genet and more. Stay connected on social!!! Facebook,Twitter and Instagram @TheTasteLA (#TasteLA)! Get A ‘Taste Of LA’ At Paramount Studios Over Labor Day Weekend! 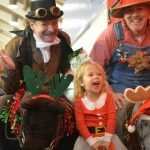 Giveaway: Win Four Tickets To Visit The Art & Craft Show At The Pamona Fairplex! 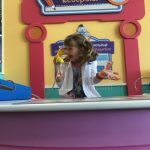 Check Out The New Doc McStuffins Exhibit At Discovery Cube Los Angeles With Our #DocAtTheCube Scavenger Hunt!